While we mainly aim to provide you with immediate, practical ideas to implement, we are also 100% guilty of drooling over our favorite authors. One of our favorites around here is Kitchen Overlord Chris-Rachael Oseland, a second generation geek with an MA in History and knack for creating delicious, cookable, unique geek-themed cookbooks that happen to be hilarious. Whovians can create fish fingers and custard with Dining with the Doctor. Her website is chock full of tested recipes that do more than just throw the name of your favorite space captain on a recipe for burgers. She does RESEARCH. She makes pastries in the shape of Pikachu. Her books are great fodder for teen and adult programs. Can you tell we love her a bit too much for our own good? Oseland has a new cookbook out for the festive winter holiday season and new Hobbit movie release. 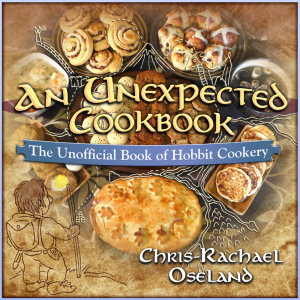 An Unexpected Cookbook just hit virtual shelves and in it, Oseland takes a unique, historical perspective that blends Tolkien’s view of the Shire with his own experiences with food insecurity and how that influenced food in his writings. And, you can actually cook the stuff in here. Q: Welcome, ‘o’ Overlord. Get us started by talking about why you chose to write this book. As a second generation geek with multiple history degrees who happens to write cookbooks for a living, how could I *not*? It started over a year ago when I decided to have a Hobbit theme week on my cooking website, Kitchen Overlord. I fell deep down the research rabbit hole. When I came up for air, I started looking for Hobbit cookbooks and was genuinely surprised to find that there weren’t any. There are half a dozen Hunger Games cookbooks, but nothing for the Shire? This had to be corrected. Q: As librarians, we love research. Your books stand out because of how well-researched they are. How did this influence the direction this book went? Most people think of The Hobbit and Lord of the Rings trilogy as medieval fantasy, but they’re actually rooted in the late Victorian era of Tolkien’s childhood and deeply influenced by the backdrop of global war in which he lived most of his adult life. Tolkien said he based the Shire in great part on his aunt’s farm at Bag End (yes, that’s a real place!) and the surrounding village, which had no cars and no train lines. He saw it as a peaceful, bucolic place untouched by the ravages of Industrialization and war. He really wanted to preserve something of that way of life in his writing before it entirely disappeared. In honor of that, I spent a heck of a lot of time researching recipes, tax records (which often tell you a lot about what people ate), and any food related documents I could get my hands on for central England. I put my research through the filters Tolkien placed on the Shire; no new world foods other than coffee, tobacco, and potatoes. That narrowed things down considerably, but left me with another issue – how far back into history should I go when eliminating “non-English” foods. After all, England was colonized by the Romans, who brought cabbages – that quintessential English food – as well as turnips, radishes, asparagus, garlic, onions, and leeks. I ended up drawing a line at the Crusades, entirely because of Tolkien’s love of seed cake. The vintage seed cake recipes I found all included caraway seeds, which are not indigenous to England at all. Q: Tell us how Tolkien made his way into the recipes? I feel that Tolkien’s intent in limiting the Shire wasn’t to create a cuisine based on nothing but nettle soup and boiled potatoes, but to lovingly preserve English country life as it was before Industrialization and World War I changed everything, in his opinion, for the worse. Q: For the history buffs out there (and librarians looking to incorporate some harmless education into programming), tell us what Tolkien might have experienced food-wise at the time? You have to remember, when Tolkien was born, the sun never set on the British Empire. England imported food from all over the world. Heck, tea, which we think of as quintessentially English, was actually a Chinese import which they later farmed in India. Recipes from that era are full of an almost child-like delight at throwing together random flavors from all over the globe just to see what will happen. Because food was insanely expensive at this time – up to 2/3 of a middle class family’s income – I also did my best to interweave the recipes so you always had a use for leftovers. The roasted apples served for pudding at last night’s Supper can be chopped up and turned into a filling for a tasty bread served at today’s Elevenses. The leftover carcass from Sunday’s roast chicken are made into broth which can be used in Mushroom Soup for tomorrow’s luncheon. Leftover potatoes end up in darn near everything. Q: We love how the recipes are divided by Hobbit meals: Breakfast, Second Breakfast, Elevenses, Luncheon, Afternoon Tea, Supper, and Dinner. Breakfast has historical recipes for porridge, home made country sausage, and hash. Second Breakfast I saw as as a time for a little morning adventure, before the day gets too hot, so all the foods are durable hand pies that can take a beating if you toss them in the bottom of your pack. Elevenses was my carb loading meal, full of both quick breads and yeast breads. Luncheon is mostly pub food, so scotch eggs, steak and ale pie, and a stewed hare. Americans would consider Afternoon Tea a meal entirely of cookies and cakes. I didn’t include any small sandwiches there since those were more of an aristocratic habit. Supper and Dinner both include a couple of main courses, like roast rack of lamb or braised oxtails, plus vegetable sides like asparagus, green beans, and peas, some mushroom dishes, and a more complicated dessert than those in the Afternoon Tea chapter. Q: You are not one to rest on laurels; what can we drool over next? Artist Tom Gordon and I spent two years creating an Illustrated Geek Cookbook. It covers 120 years of geek culture, from HG Wells The Time Machine to the Fox show Sleepy Hollow plus homages to many games, comics, books, tv shows, and movies. It’ll be available on Amazon in December. Readers can get a preview of it. Q: Finally, one of the things we love about you is how you incorporate history and research into your books and recipes. How did these interests lead to writing cookbooks? An advanced degree can be surprisingly useful outside your original profession of choice. I thought I’d be a college tenure track faculty member. Some people might think I wasted my time learning Sumerian cuneiform, but the research skills and passion for history have made my non-academic career possible today. Both the recipes linked to look great. I’m going to put this on my to-buy list, thanks!